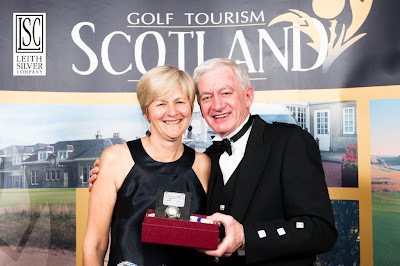 Last November Golf Tourism Scotland was very pleased to welcome The Leith Silver Company as a sponsor of the Gold Standard Awards Dinner and The 2012 Lifetime Achievement Award. 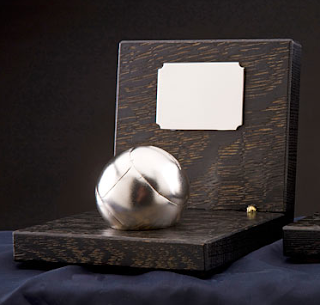 The Leith Silver Company team provided the award in the form of a silver featherie golf ball on ebonised oak base. The winner of that award was Malcolm Campbell the well known golf writer who at the time of the dinner was fishing in the Everglades. 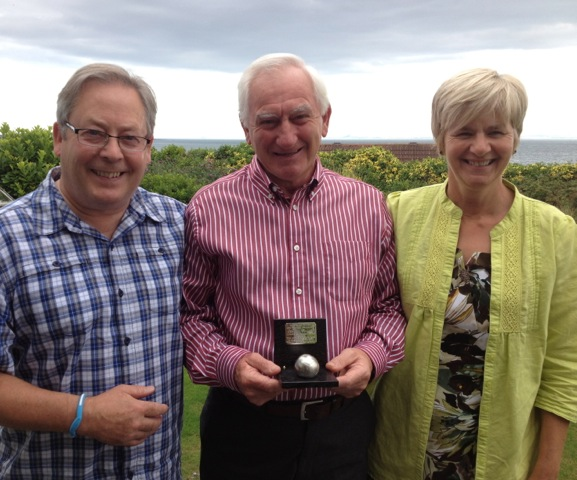 However Malcolm's brother Iain was on hand to accept the award on his behalf. Unable to meet Malcolm on the night, Leith Silver Company's Clunie Conochie made contact with the Lifetime Achievement Award Winner to arrange a time to meet. Both Malcolm and Clunie could not have imagined how long it would take to find a perfect time to make this happen. However Clunie contacted GTS last week to let us know that finally she was able to meet Malcolm. "It’s a long drive from Inverness to the Peat Inn in Fife for lunch. But this wasn’t just lunch – finally we met up with Malcolm Campbell, winner of the GTS Lifetime Achievement Award 2012 which we sponsored. Malcolm had been delayed in the USA at the time of the event and his brother received it on his behalf. Over lunch in Fife, we got to meet Malcolm and hear some interesting stories. It really was a great opportunity to go full circle with our support of the Lifetime Achievement Award, to finally meet the winner. Malcolm is a man of many talents and it wasn't long before a call came in from his wife Jane who owns a cafe in Fife, there was a problem with the dishwasher. Luckily the spare part had yet to arrive so no chance for us to help! After lunch it was back to Malcolm and Jane's, we were able to take advantage of the nice weather for a quick photo." The Leith Silver Company are pleased to announce they will once again sponsor the Lifetime Achievement Award at this year's dinner, taking place 22nd November at Cameron House Resort.